I’m 24, and I’m finishing up college. I’ve been driving an old, used car for a while now, and I’m thinking about getting a new one. I’ve managed to save up about $30,000 from my jobs, but every time I go to a car dealer they want me to finance a new car instead of paying cash for one. What do you think I should do? Who gives a crap what the car dealers want? This is your purchase, not theirs. Besides, the only reason they want you to finance is so they’ll make a lot more money off the deal. Dude, you’re a 24-year-old college student who has been smart enough and industrious enough to scrape up $30,000 over the last few years. You don’t need to throw a huge chunk of that into something that’s going to go down in value like a rock. 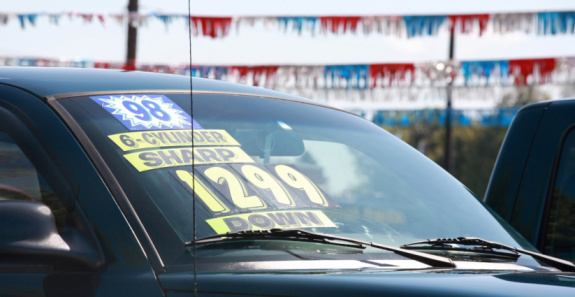 New cars lose 60 percent of their value in the first four years. A $28,000 car would be worth around $11,000 after that period of time. That’s not what I call a smart investment. You don’t need a brand-new car, Devon. Once you’ve got a million dollars in the bank, then you can go out and buy a new car. For now, you need to stick with good, used, low-mileage vehicles that are about three or four years old. If I were in your shoes and had your budget, I’d shop around and pay cash for a cool little $10,000 car. You can get a great automobile for that kind of money, plus you’ll still have the majority of your savings sitting there! *For more financial advice please visit daveramsey.com.